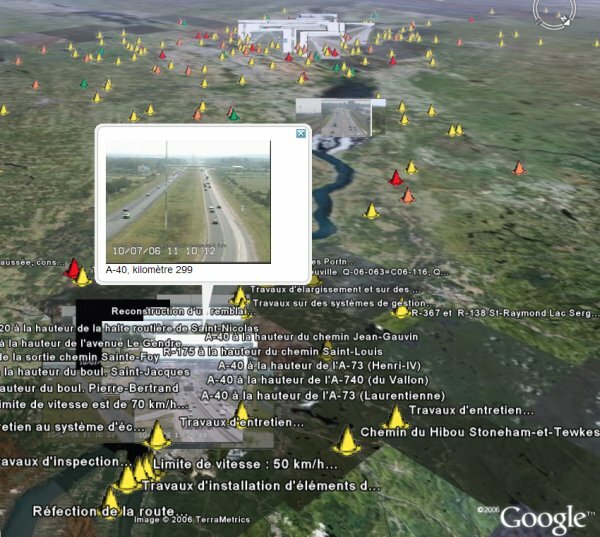 Mike Pegg at GoogleMapsMania just let me know about a Google Earth file which shows traffic cameras for Quebec and Montreal in Canada. What is interesting about this collection of placemarks is that they put the camera shots in the icons above each location. It makes for a fast way to look at lots of camera shots. Not only that, but it is a network link which updates every 2.5 minutes so you're getting a pretty much near-real-time picture of the traffic situation in these two cities. You can see a Google Maps version of this site as well, but I like the GE version better. via GoogleMapsMania.